She's taller. She's stronger. She's younger. She's prettier. No. It's not Kate Upton supplanting Heidi Klum in the pages of Vogue or Jennifer Lawrence outshining Renee Zellweger on the silver screen. It's Food Runners brand new truck. Purchased in June, thanks to a generous grant from Genentech, the new truck hit the road on July 26th. All 16' x 7' x 13' of her. Beautifully detailed and painted with the Food Runners logo and brand new slogan, "delivering excess food." Wave and smile next time you see her about town. Keith G. is ecstatic. He was instrumental in the truck's selection as well as in directing the specifications for the truck's custom shelving that enables Food Runners to pick up large quantities of prepared food packed for safe transport in foil hotel pans. "The new truck is so much smoother than the old truck and having the shelving on both sides instead of one, allows us to store more food." Keith should know. He drives the truck every Saturday to the Ferry Building Farmers Market where he and his assistant, Seth A, make the rounds collecting excess produce from the vendors. You can hear Keith's cry, "bring out your food!" each week at 2PM at the close of the market. This time of year is peak season often netting over 1,500 pounds of gorgeous, farm fresh produce to be delivered to San Franciscans in need. Keith's entire pick up/delivery route takes 3-4 hours. Keith has been doing the Saturday Ferry Building Farmers Market run for over 20 years. Keith is a volunteer! Shelving on both sides!! Volunteer Sam L. loading up. So, what happened to the old truck? Food Runners Executive Director Mary Risley donated it to the Sisters at Fraternite Notre Dame, a tiny soup kitchen doing big things on one of the worst blocks in the Tenderloin. Sister Marie Benedict (the tall one) and Sister Marie Bernadette (the petite one), work tirelessly to serve 300 meals per day, Monday through Wednesday in their itty-bitty dining room on Turk Street. On Tuesday evenings, you can find the Sisters serving meals to the homeless outdoors at United Nations Plaza. 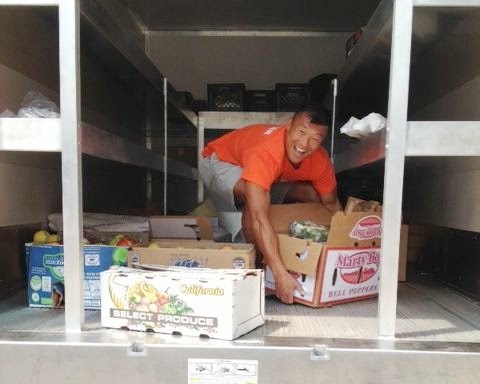 The Sisters have been in need of a large vehicle for a very long time in order to transport food and supplies for their weekly outreach programs in areas like Bayview/Hunter's Point. Through Mary's generosity, Food Runners was able to answer the Sister's prayers. The new truck is a benefit to all. It looks great. It drives great. Food Runners truck drivers love it, and, more importantly, the new truck is able to transport more food than ever before. As the cost of living in San Francisco continues to increase, so does the need. Food Runners is there. With over 250 volunteers, a bike courier and a brand new truck. Delivering excess food. Got bike? Got bike trailer? Or know anyone who does? Tell them about Food Runners. The "new wave" is here. Food Runners is seeking volunteers with bike trailers to pick up food in congested downtown areas where car parking is non-existent. Get some exercise and feed the hungry in one fell swoop. Lots of amazing food out there ready to be donated. Lots of smiles to be collected upon delivery to folks in need. Volunteer here or call 415-929-1866. Best phone call ever!